WASHINGTON (AP) — The White House is commending NBA veteran Jason Collins for becoming the first active male player in the four major American professional sports to come out as gay. White House spokesman Jay Carney called that decision courageous and says the White House supports Collins. He says he hopes the 34-year-old center’s NBA colleagues will also offer support. 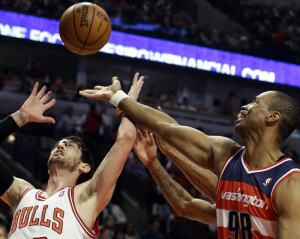 In this April 17, 2013 file photo, Washington Wizards center Jason Collins, right, battles for a rebound against Chicago Bulls guard Kirk Hinrich during the first half of an NBA basketball game in Chicago. Jason Collins has become the first male professional athlete in the major four American sports leagues to come out as gay. Collins wrote a first-person account posted Monday on Sports Illustrated’s website. The 34-year-old Collins has played for six NBA teams in 12 seasons. He finished this past season with the Washington Wizards and is now a free agent. He says he wants to continue playing. Obama announced his support for gay marriage during his re-election campaign last year. Former President Bill Clinton also voiced encouragement for Collins, asking fans, NBA colleagues and the media to support and respect him in a statement Monday. Clinton said he has known Collins since he attended Stanford University with his daughter Chelsea. Chelsea Clinton also tweeted her support for Collins Monday, saying she was proud of her friend for having the strength and courage to be the first openly gay player in the NBA. Collins announced he is gay Monday in a first-person account posted on Sports Illustrated’s website. He has played for six teams in 12 seasons, including this past season with the Washington Wizards. He is now a free agent.